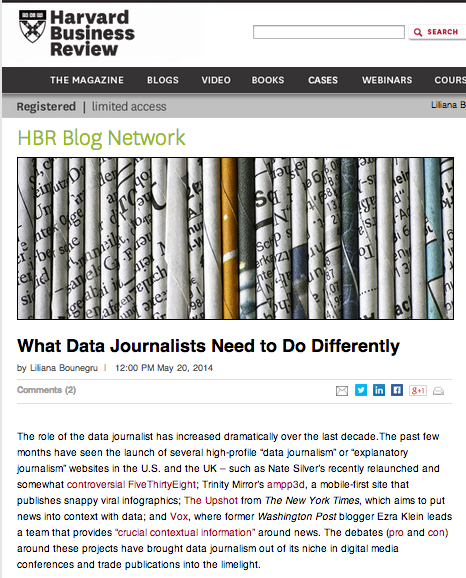 I recently wrote a piece for the Harvard Business Review arguing that data journalists should be more critical and creative in the way they source the data they use for their reportage. In parallel to my work at the European Journalism Centre, for the past couple of years I have been working on and off on a research project that examines sourcing and knowledge production practices in data journalism and how these might be challenging traditional journalism epistemologies. I gave a talk at Stanford University last year about the first part of this study. Thanks to a four-year PhD grant from the University of Groningen and the University of Ghent, I will be able to dedicate more time to this project in the next few years, expand and improve it. Below is a list of academic papers about data journalism and computational journalism that I collected during my work so far. A few of them, such as Schudson (2010) and Peters (2010) do not directly reference the practice of data journalism but discuss related and relevant developments.